Synergy Thrislington offer both 60mm and 80mm thick fully relocatable and demountable monobloc systems for the office market. 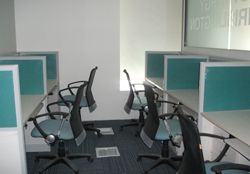 With numerous design options available, flexible solutions can be offered to meet all client requirements. Both systems can be manufactured to any specific module width up to and including 1500mm, with all standard solid, glazed and door modules being fully interchangeable. SSingle and double glazed options are available. The 60mm is available single glazed which can be fire rated, non fire rated option in single and double glazed with plastic beading which facilitated on site glazing. 80mm is double glazed, which can be fire rated and incorporate integral blinds. Various aesthetic formats can be achieved employing standard details, with alternative jointing methods, finishes, skirting and head details. 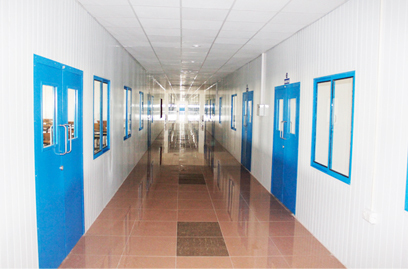 The interpretation of a cleanroom can vary from industry to industry and customer to customer, with each application being designed to suit the idiosyncratic needs of the individual company requirement. It may be that your process facility needs a simple 'clean up' or a radical transformation to accommodate the stringent manufacturing and production standards dictated by the statutory authorities responsible for ensuring Good Manufacturing Practice (GMP) for your particular industry. For over 50 years, Thrislington have worked alongside designers, end users and specialist contractors to ensure the most economical and practical solution is achieved to enable your business to meet the challenges of an ever changing and demanding global market place. 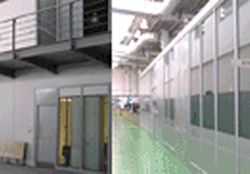 The Synergy Thrislington range of 60mm and 80mm cleanroom partition systems have proven themselves worldwide in many cleanroom applications. Available in panel heights of up to 5000mm and supported by integral doorsets together with flush glazed windows the Thrislington systems present the ideal solution. The ability to incorporate service routes within panels during manufacture saves valuable time on site and enables projects to be completed efficiently and exactly to clients performance specifications. 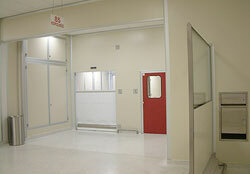 Synergy Thrislington walk on ceiling perfectly complements the cleanroom partition system. 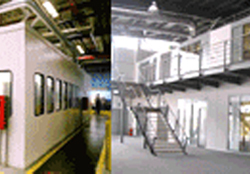 Maintenance access above the ceiling is available without the need for secondary walkways and along with the high degree of factory formed service penetrations ensure that Synergy Thrislington is first choice in today's world of performance contracting. This market sector is synonymous with Synergy Thrislington, who have specialized in providing custom solutions to meet the most demanding challenges and requirements. The highest, widest and longest enclosures have never yet defeated the engineering expertise and structural know how of Synergy Thrislington, to produce a combination of products to solve the requirements associated with modern day industrial process environments. For over fifty years Synergy Thrislington has manufactured double skin and single skin steel partition and ceiling systems to meet the demands of this particular area, offering the perfect solution to meet the most exacting requirements including the cost effective 'Box in Box' construction together with self contained "PODS". 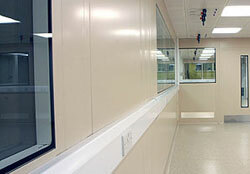 The ceiling membrane is of vital importance to the integrity and performance of any cleanroom. The concept of ceilings can vary from simple suspended lay-in grid types to sophisticated 'walk on' construction and plenums. The Synergy Thrislington Walk on Ceiling is a product that offers amazing options in creating custom and system build solutions to the most intricate and complicated of enclosures for the demanding environments of the cleanroom user. A maintenance engineer can walk on top of the ceiling to gain access to services and components without the need to engage elaborate access equipment normally associated with more basic ceiling installations and the servicing thereof. Panels are constructed to a standard width of 750mm, being 60mm or 80mm thick and the ceiling system is supported either on the partitions or by a lattice truss system to create spans not normally associated with partitions and ceiling enclosures. The steelwork is also designed, manufactured and installed by Thrislington Structural mezzanine floor applications are also available where high load specification are required. Subject to specification, each plank will hold a superimposed load of 27 kg/m² together with a point load 150 kilos. Whilst the basic system is supported on the partitions, Synergy Thrislington can also provide plank and tile alternatives designed to be suspended from a concrete or steelwork structure by a unique hanging system. In these situations the ceiling can be installed independently from the partitioning, giving greater relocatable advantages for subsequent layout changes. Standard door modules are 1000mm wide to either the standard height of 2080mm or to special design with regard to the partition elevation. Door leaves can be provided in either steel, timber veneer or laminate faced, 50mm thick, with vision panels in any shape, format and size. Steel door leaves are manufacture similar to solid panel elements incorporating insulation and acoustic / fire requirements to suit each specific application. Timber doors are of solid or semi solid core construction, manufactured in our own joinery department to the appropriate standard, with natural timber veneers and matching edge lippings. Vision panels are available and can be single or double glazed, square, rectangular or porthole type, with a choice of beading to achieve a recessed, semi-flush or completely flush detail. 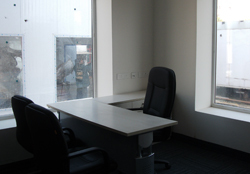 The Status 6 and Status 8 partition systems offer a variety of glazing options. The Status 8 system offers double glazed panels (with the option of integral blinds), offset single glazed or centrally glazed all of which are assembled in our factory and delivery to site for immediate installation. Flush glazed, aluminum framed and gasket retained glazing solutions are available to complement the status 6 and status 8 systems.